Jul 14 2016 - A new study using ground and satellite GPS monitors have concluded that the north-eastern corner of the Indian subcontinent encompassing Bangladesh, eastern India and parts of Myanmar is at risk of a major earthquake, and the effect when it occurs would be on a massive scale (8.2 to 9 on the Richter scale). The study conducted at the Lamont-Doherty Earth Observatory at Columbia University should be taken seriously, particularly by Bangladesh which has several issues going against it in the event of a major quake. We have long been warned that Bangladesh is at high risk of getting hit by a major quake and over the last year, and the city has been experiencing minor quakes from time to time. Now that scientific data has been presented, we need to assess the impediments to the relief and rescue operations and adopt suitable measures to mitigate the likely impact. Although no timeline can be predicted, Dhaka would be badly hit and we should remember that 17 million people call it their home. 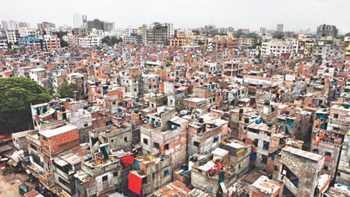 A big quake will result in the flattening of Dhaka’s high rise skyline since most buildings fail to conform to standards set in the building code. Poor construction means lots of falling debris on to the extremely congested lanes and roads of Dhaka city. Getting relief to those trapped under buildings will be the single largest challenge for a post-quake event. These are challenges that need to be met headlong by policymakers.